If you want to mix and match your Leylandii hedging between gold and green and want to keep the price break you get for quantities purchased, then purchase the total amount you need in gold or green and specify at checkout how you want them split e.g. 50:50 green and gold. 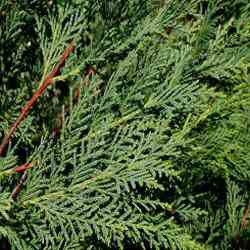 It is an upright evergreen conifer that can grow to more than 30m in height. It is very symmetrical and assumes a pyramid or columnar shape. The needles are overlapping and scaly and are assembled into flattened sprays that densely cover the upward curving branches. If you notice small amounts of browning in your Leylandii, this is normal winter weathering from the cold or wind. You can leave them or cut them out. How many Leylandii hedging trees do I need? Let the controversy begin! How many you need depends on who you ask and how high you want the hedge to grow. For a 6ft or 1.8 metre high hedge then plant 2ft or 60cm apart. For a 12 ft or 3.7 metre high hedge then plant 3ft or 90cm apart. For a neighbour annoying and sunlight blocking 18ft or 6 metre hedge then plant 4.5ft or 1.4 metres apart. To REALLY confuse you, this author has a garden lined 6ft or 1.8 metre high hedge in his garden and they are all planted 1ft or 30 cm apart +/- 20 cm in a single line. It provides a really thick hedge with the first branches starting within a fist distance of the ground. This provides an excellent barrier to everything except the smallest of animals. It requires pruning once or twice a year.